Our lab studies how well babies can remember objects. The test that we have developed is a baby-friendly version of the card game Memory, where cards are shown face-up (on a computer screen), then turned face-down. As in the original game, the goal is to find matching cards. But, instead of pointing (these children are too young to point or even understand our instructions! ), we use an eye-tracker to see if the infant looks toward the matching card (we use fun, visual rewards on matching cards to encourage this anticipatory looking). This work, though, faces a serious challenge: How can we know how hard babies are trying? 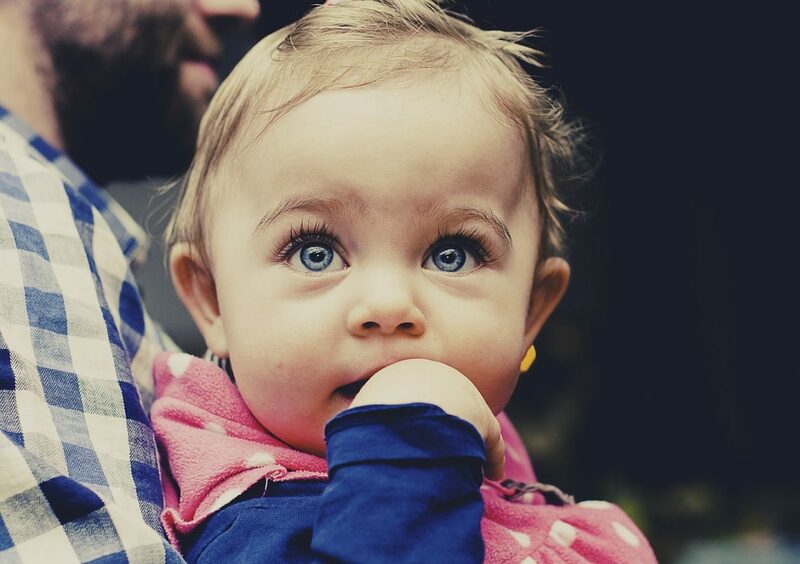 Motivation and effort are relatively easy to determine in adults and older children, “Please try your best on this test – think hard about your responses – and if you do well, you’ll get a reward!” But what about a one-year-old? And, the stakes are high. If we do not isolate those moments when infants are “on task,” and instead average them together with their inattentive moments, we will systematically underestimate their abilities. Luckily, there is a window – an approximately 4 mm window to be exact – into infants’ effort levels: the pupil. Alongside the familiar pupillary light reflex, where the pupil (or, more precisely, the iris sphincter muscle) dilates to let in more light in dim situations and narrows to limit light in bright ones, is another response, linked to the brain’s arousal system. This response is driven by engagement and effort, dilating (by a fraction of a mm) the pupils of a poker player when she gets a full house, or a person trying to remember a sequence of digits in his head. Nobel Prize winner Daniel Kahneman popularized pupillometry more than 50 years ago to gain insight into cognitive effort. By monitoring pupil dilation as infants play our Memory game, we have access to this sensitive, involuntary, real-time measure of effort. In a recently published study, we found that infants who exerted greater effort while cards were being presented face-up remembered them better and were able to find matches more often. Even moment-by-moment, those rounds of the game where pupils were larger were more likely to be rounds where matches were found. This shows that pupillometry can be used as a measure of cognitive effort in infants, and a means to identify those individuals, and moments, where effort is maximized. In our view, this not only allows for a truer measure of infants’ memory but also other cognitive abilities such as higher-level reasoning and decision making. These findings are described in the article entitled Focused attention predicts visual working memory performance in 13-month-old infants: A pupillometric study, recently published in the journal Developmental Cognitive Neuroscience. (Note: This is an open-access publication. A supplementary video linked to the article shows an infant participating in the study, along with the experimental animation sequence showing her eye trace. Erik Blaser studies visual perception and attention in adults and in early development, and leads the Human Vision Lab at the University of Massachusetts Boston. He is interested in adapting adult psychophysical paradigms to infants and children - both in typical development and those diagnosed with Autism Spectrum Disorder.